People have problems with their teeth all the time. A cracked tooth, a chipped tooth, a loose tooth, tooth decay, root canal work, moving wisdom teeth, loose dental implants… the list is almost endless. However, having a broken tooth is more common among adults than you might think. 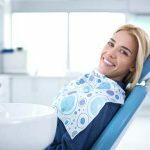 According to some studies, it’s the third leading cause of tooth loss in industrialized nations and dentists will encounter patients with chipped teeth at least daily in their practice. Additionally, endodontists (dentists who specialize in procedures to save teeth), have reported that more patients are referred to them because of cracked teeth than decayed teeth. Let’s discuss some of the most common questions surrounding this ailment. 1. 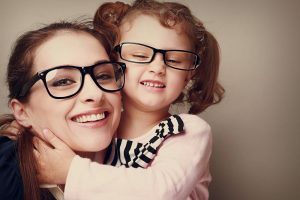 What’s the difference between an adult tooth and a child’s tooth? Adult teeth (or permanent teeth) and ‘baby teeth’ differ in a few key ways. First, people generally have 20 baby teeth and 32 adult teeth. Baby teeth are temporary; they’ll fall out as a child grows and new permanent adult teeth will erupt in their place. Permanent teeth usually begin coming in around age five. Second, baby teeth look different than adult teeth. Baby teeth are whiter and have thinner layers of enamel than adult teeth. Their roots are also long and slender, but not very deep. That makes them weaker than adult teeth. Third, a permanent tooth will not grow back once it’s been removed; you only have one set of adult teeth.This is one of biggest reasons why daily dental care is so important, and why it’s important to see a dentist as soon as possible after a tooth injury. 2. 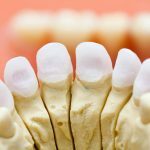 Is breaking a permanent tooth a big deal? Breaking an adult tooth is a very big deal. 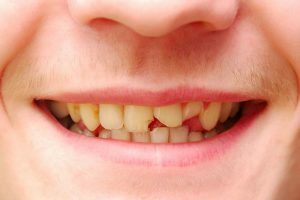 Broken teeth are a dental emergency that should be examined immediately. Even a seemingly small break can stress the tooth making it difficult to eat or speak. Breaks also allow an opening for food and bacteria to get stuck, resulting in an infection. Without treatment, a broken tooth could get crushed and become unable to be saved. We often show our teeth while talking and smiling so it can feel quite embarrassing to have a broken tooth, especially if it’s highly visible. A dentist will take measures to repair your tooth as natural-looking as possible. 3. How do people break their teeth? The outer covering of your teeth—the enamel—is incredibly strong but there are all sorts of ways that you can chip and break your teeth. Some teeth are broken by a sudden injury like while playing sports or during a trip and fall. Other times, they can break when we use our teeth for things we’re not supposed to, like opening containers or chewing on a pen. Teeth that have been weakened over time by decay are more likely to break during normal eating activities. Weakened teeth can break while eating things such as hard candy, chips, apples or granola bars. Chewing on ice is another common culprit. 4. What happens if I bang my teeth but nothing breaks off? It’s definitely possible to hit your teeth on something without anything breaking off but that doesn’t mean you’re in the clear. You likely still caused damage, even if you can’t see it. This is often referred to as having cracked a tooth. Some cracks may be shallow but others can extend through the whole tooth. Such cracks weaken the tooth making it more likely to break or get crushed during normal activities. It’s usually very difficult to see cracks like these with the naked eye. Visit a dentist as soon as possible to have your teeth evaluated. 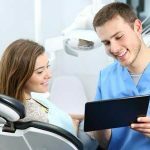 Dentists can use a variety of methods such as microscopes and x-ray to make sure your teeth haven’t been compromised. 5. What are some of the signs and symptoms that I broke or cracked a tooth? Make sure to visit a dentist as soon as possible, no matter what symptoms you’re experiencing. An emergency dentist will properly evaluate your symptoms and situation then recommend treatment. 6. What should I do if I break a tooth? Breaking a tooth can be a scary experience because it usually happens suddenly, away from home, and outside normal business hours. Even so, do your best to stay calm so you can think clearly. Thinking clearly enables you to communicate your problem to others and to properly take care of the injury. Rinse out your mouth using lukewarm water. Save any broken pieces of tooth. They’ll need to stay moist so you can either pocket them between your gums and cheek or put them in a small container then cover with milk. If your whole tooth has been knocked out you can put it back in the socket it came from. When that’s not possible you can save it the same way you would for broken pieces. Stop any bleeding by applying pressure to the socket and gums. Do this by biting down on gauze or a paper towel for approximately ten to 15 minutes. Reduce swelling by applying a cold pack to the area outside of the broken tooth. In the event that it’ll be a while until you see the dentist, you can cover the tooth using over-the-counter dental cement. This is found in most groceries and drugstores. 7. Will I lose my tooth? 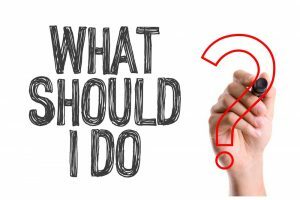 In most cases, it’s possible to save a broken tooth if you take good care of it right after the injury and get to a dentist as soon as possible. Saving the tooth will largely depend on how much tooth is missing and whether any nerve endings are exposed. 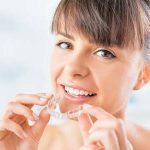 But, even if the tooth does have to be extracted the dentist can recommend several options in its place.